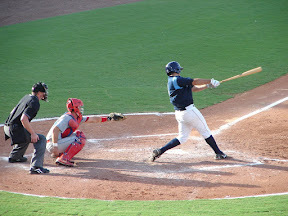 The Charlotte Stone Crabs swept the Jupiter Hammerheads by winning Wednesday's game 5-2 at Roger Dean Stadium. This is the second time this season that the Stone Crabs have swept an opponent. Jupiter took the lead in the fourth inning. Daniel Pertusati struck an RBI single to center that scored Jake Smolinksi to give the Hammerheads a 1-0 lead. The Stone Crabs battled back to tie the game in the fifth. Jake Jefferies opened up the inning with a single then Matt Hall would later reach on a ground ball to third. Isaias Velasquez then drew a walk to load the bases. A balk would allow all runners to advance a base, scoring Jefferies and tying the game 1-1. The Stone Crabs took the lead an inning later. Stephen Vogt tripled to right to lead off the inning. Henry Wrigley would drive him home with an RBI single to left. Wrigley would later score on a pop fly by Reid Fronk and the Stone Crabs took a 3-1 lead. Jupiter added another run in the seventh inning. An RBI triple by Ernesto Manzanillo scored Pertusati to pull them within a run of the lead 3-2. Charlotte added some separation in the eighth aided by wild pitching by Jupiter. Greg Sexton was hit by a pitch to start the inning followed by a walk to Jefferies. They then intentionally walked Fronk to load the bases. Velasquez then drew a bases loaded walk to push across Sexton and increase the lead to 4-2. The Stone Crabs added another insurance run in the ninth inning. Stephen Vogt led off the inning with a single to left. Vogt would later score on a sac fly by Jefferies and the Stone Crabs held on for a 5-2 victory, sweeping the three game series. Nick Barnese improved to 5-3 with the win, pitching 5 innings and allowing a run on 6 hits with 2 strikeouts and a walk. Chris Andujar pitched two innings in relief, surrendering a run on 1 hit with a strikeout and a walk. Josh Satow picked up his ninth save of the season with 2 shut-out innings, striking out 1 and walking 1. The Stone Crabs (37-25) return home to Charlotte Sports Park to begin an 6-day 7-game homestand to end the first half of the season. They will begin the homestand with a three game series against the rival Fort Myers Miracle (26-36). Game one of the series will be a battle of lefties as Frank De Los Santos (5-3, 4.76) pitches against Dan Osterbrock (3-4, 3.14).